Warming is accelerating. For some time, it has been warmer than the 1.5°C guardrail that the Paris Agreement promised should not be crossed. This conclusion follows from above analysis of NASA land+ocean data 1880-October 2017, adjusted by 0.59°C to cater for the rise from preindustrial and with a trend added that also indicates that the global temperature look set to cross the 2°C guardrail soon, with 2021 falling within the margins of the trend line. The trend line shows a strong and ominous direction upward. Nonetheless, the situation could be even more dire than this trend indicates, since some warming elements are not fully incorporated in these data. As an example, the NASA data look at the temperature at the surface of the oceans, which has increased strongly, as also illustrated by the image on the right. Much warming has also occurred below the sea surface, while there has been some cooling of the sea surface. 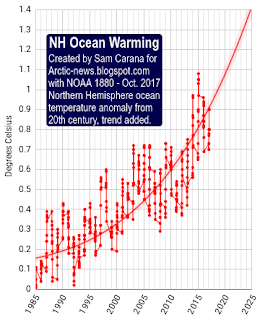 Moreover, ocean heat has also increased strongly over the years, as the image below illustrates, and looks set to increase further. After all, what happens to oceans is important, as 93.4% of global warming currently goes into oceans. The fact that much warming is taking place below the sea surface could make that it gets overlooked. If much of this warming were to get transferred from the Arctic Ocean to the atmosphere over the next few years, then the temperature rise over the next few years could take an even sharper turn upward. The threat that warming below the sea surface is overlooked is highlighted by the image below, which shows huge warming of Arctic waters at selected locations near Svalbard. 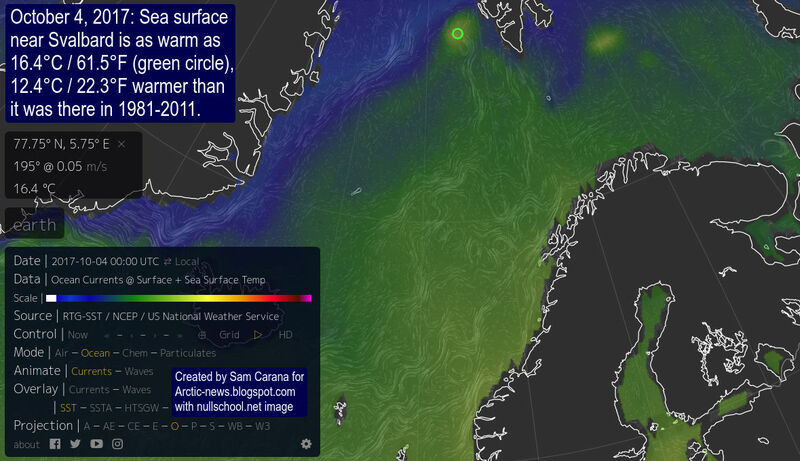 Above image focuses on temperatures at selected locations near Svalbard (see map below). In 1981-2011, temperatures were gradually falling by more than one degree Celsius over the period of measurement, i.e. from October 1 to November 23 (blue line), a fall that is in line with the change in seasons. 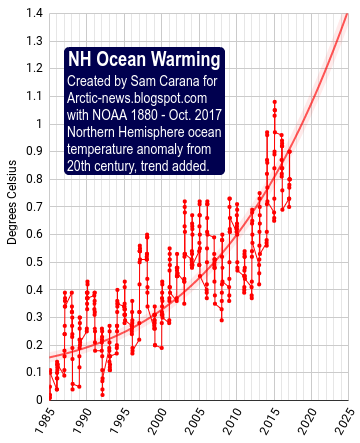 Over this period in 2017, temperatures were 13.19°C or 23.77°F higher than in 1981-2011, while the temperature didn't seem to be falling (red line). 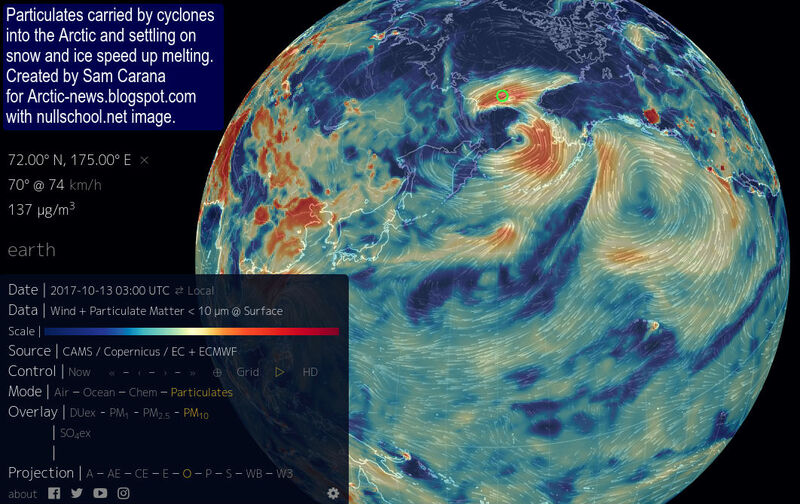 How could these waters get a stunning 13.19°C warmer than two decades ago? Global warming did hit the North Atlantic hard, particularly along the track of the Gulf Stream all the way to the Arctic Ocean. This has translated into stronger winds along the track of the Gulf Stream, which are making that ever larger amounts of warm water are getting pushed from the North Atlantic to the Arctic Ocean. A temperature rise underneath the sea surface can be overlooked when merely monitoring the average surface temperature of the Arctic Ocean, especially when stronger winds have caused more evaporation, cooling down the water at the surface. 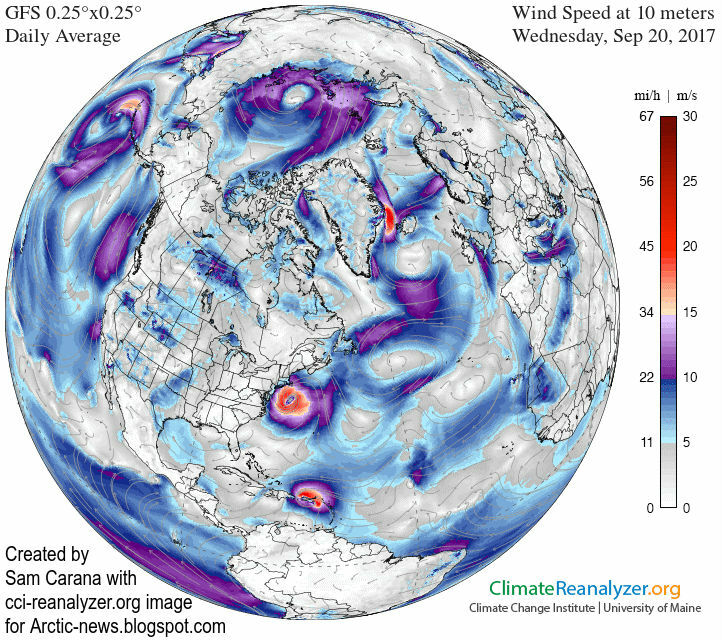 Stronger winds, higher temperatures and the presence of more open water in the Arctic have all contributed to stronger rainfall in the Arctic. It looks like the rain did cause a freshwater lid to form at the surface of the Arctic Ocean, acting as an insulator and preventing transfer of ocean heat to the atmosphere. 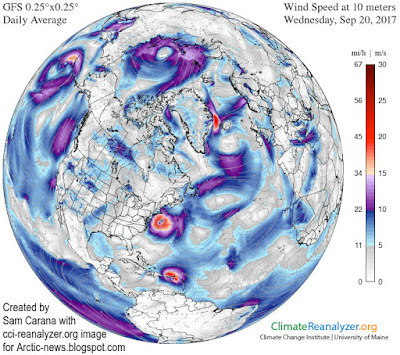 This also contributed to a colder atmosphere over the Arctic Ocean, i.e. colder than it would otherwise have been. At the same time, since less heat could escape from the Arctic Ocean to the atmosphere, this freshwater lid has resulted in warmer water, as is evident from the huge anomalies at the locations near Svalbard. 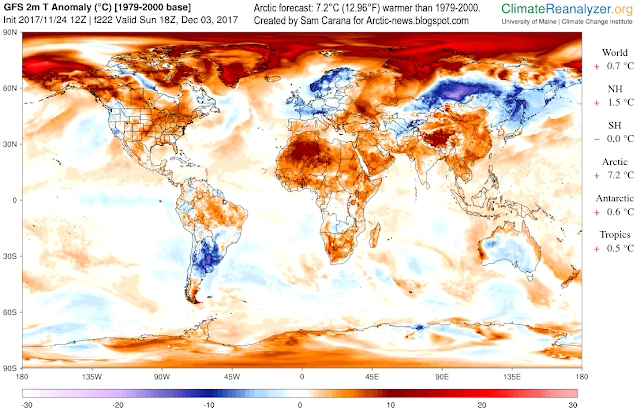 The forecast below that Arctic will be 7.2°C or 12.96°F warmer than in 1979-2000 on December 3, 2017, illustrates just how warm the Arctic Ocean currently is. This freshwater lid has also made it easier for sea ice to form at the surface, as ice will form in freshwater as warm as just below 0°C (or 32°F), compared to salty seawater that must cool down to -2°C (or 28.4°F) before freezing. The seawater underneath the sea ice is warm enough to melt the ice from below, but the layer of freshwater at the surface acts as an insulator. There would have been less sea ice, had it not been for the rain resulting in this freshwater lid. Much of the freshwater lid did turn into sea ice in September 2017, as air temperatures came down below 0°Cs, and this sea ice similarly acted as an insulator, preventing transfer of heat from the Arctic Ocean to the atmosphere. Importantly, while much of the additional freshwater at the surface did turn into sea ice in 2017, this is only a temporary phenomenon, as no ice will form once the surface of the water will stay above 0°C, which looks imminent as temperatures keep rising. Further sea ice loss means that less sunlight will get reflected back into space and will instead get absorbed by the Arctic, further accelerating warming in the arctic. Stronger cyclones can also bring more particulates into the Arctic Ocean, speeding up the demise of sea ice by darkening it when settling on ice, as illustrated by the image on the right. In conclusion, while the formation of the freshwater lid at the surface of the Arctic Ocean has been holding back the collapse of the sea ice, the delay of the collapse can only be a temporary one as temperatures keep rising. The Arctic Ocean is warming at accelerating speed and collapse of the sea ice looks imminent. 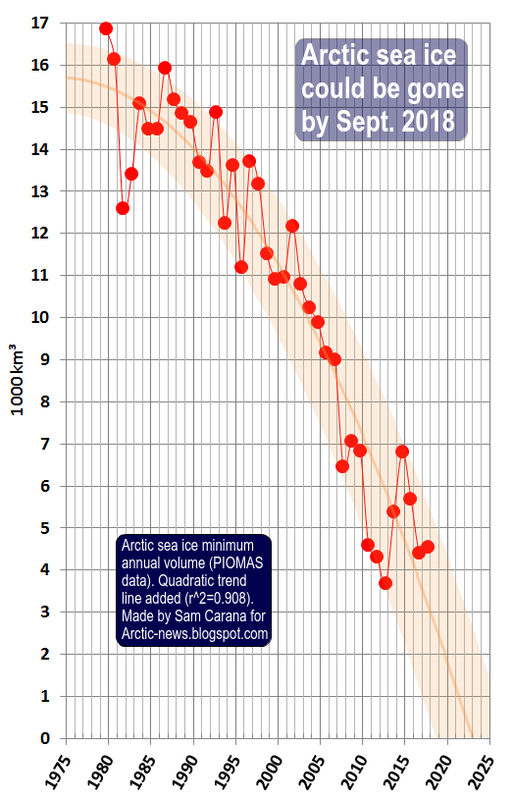 Above images confirm the loss of the thicker sea ice over the past few years, while zero Arctic sea ice is within the margins of the trend line of the image on the right. Another point to consider is latent heat, as discussed in earlier posts. The danger is illustrated by the image below, showing that heat threatens to destabilize methane hydrates at the seafloor of the Arctic Ocean. As the temperature of the Arctic Ocean keeps rising, more heat threatens to reach sediments that have until now remained frozen. Melting of the ice in these sediments then threatens to unleash huge eruptions of seafloor methane that has until now been kept locked up by the permafrost. Additionally, melting of permafrost on land can cause rapid decomposition of soils, resulting in releases of huge amounts of greenhouse gases, further accelerating warming in the Arctic, which in turn will result in more greenhouse gases (CO2, CH4, N2O, water vapor) entering the Arctic atmosphere, more albedo changes, etc., in a vicious self-reinforcing cycle of runaway warming. 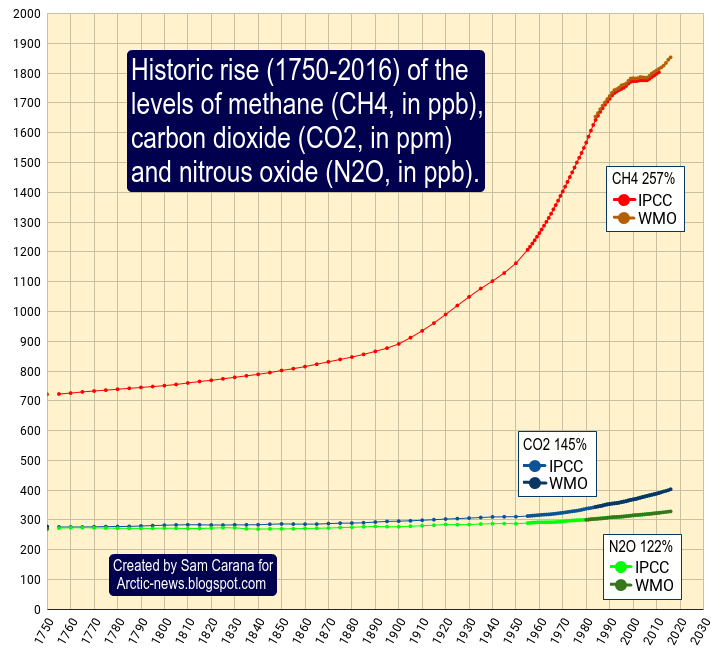 Levels of CO2, CH4 an N2O have been rising rapidly since 1750, as above image shows. Methane levels have risen 257% since 1750. One explanation for the apparent slowdown is that, as temperatures kept rising, water vapor in the atmosphere increased accordingly (7% more water vapor for every 1°C warming), resulting in more hydroxyl that broke down more methane in the atmosphere since 1990. So, while the rise in methane levels appeared to slow down, methane emissions were actually continuing to increase, but as an increasingly large part of methane was decomposed by hydroxyl, this rise in methane was overlooked. In 2007, Arctic sea ice reached a record low, triggering more methane eruptions from the seafloor of the Arctic Ocean. While hydroxyl kept increasing, seafloor methane kept increasing faster, making that methane emissions increasingly started to overwhelm hydroxyl, resulting in a stronger rise in overall methane levels. 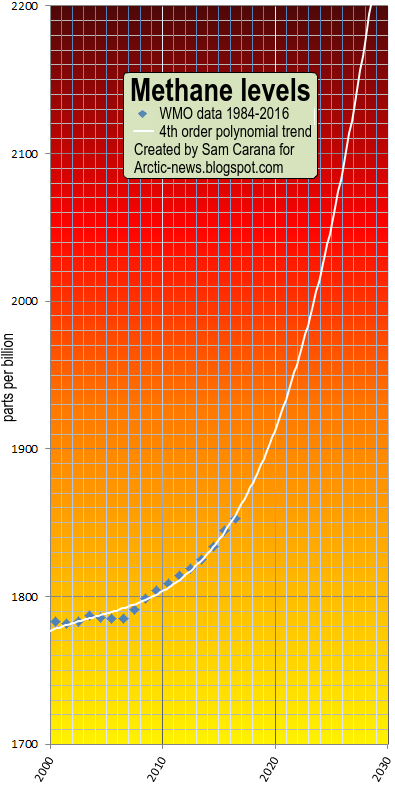 In 2013, I estimated methane emissions at 771 Tg/y, whereas the IPCC's estimate was 678 Tg/y. The post estimated methane from hydrates and permafrost at 13% of total methane emissions, whereas the IPCC's estimate was a mere 1% of total methane emissions. - Sam Carana, Dec. 2017. 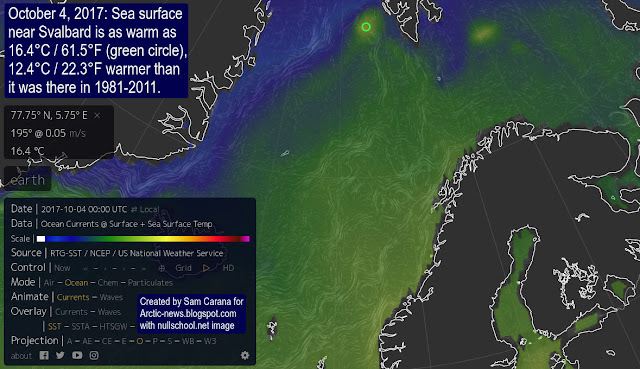 The presence of methane is felt particularly strongly over the Arctic Ocean. Above images show high methane levels over the Arctic Ocean on December 2, 2017, when methane reached a peak level of 2771 ppb and on December 13 and 14, 2017, when peak levels as high as 2713 ppb were reached. 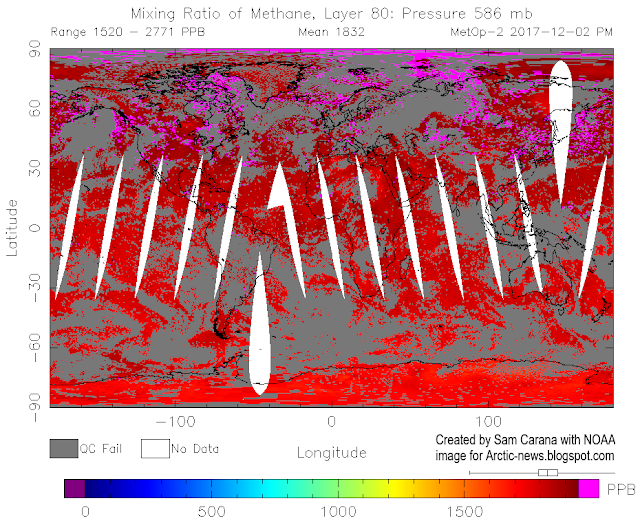 Methane levels have been rising strongly since 2000 and this rise looks set to continue, as illustrated by the image on the right. There is also a danger that, as temperatures keep rising, the course of the ocean current near Svalbard could change, making that more heat will reach the East Siberian Arctic Shelf (ESAS), thus further warming up sediments there, resulting in huge amounts of methane erupting from the seafloor. Add up the impact of all warming elements and, as an earlier analysis shows, the rise in mean global temperatures from preindustrial could be more than 10°C in a matter of years, as illustrated by the images below. A 2°C rise in temperature alone is devastating, especially when considering that temperature peaks in history look to have been less high than previously thought, as concluded by a recent study in ocean paleotemperature. Therefore, a 10°C rise may well result in the warmest temperatures experienced on Earth. Moreover, the speed at which this rise could occur leaves little or no time for plants and animals to adapt, in contrast to historical climate swings that typically took many years to eventuate.